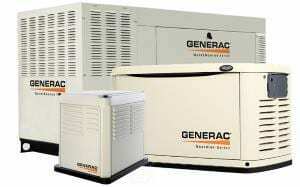 The size of a generator is dictated by the customer’s load, and it varies depending on the customer’s requirements. For example at a customers location they may require an air conditioner, some refrigeration, some test lab powering – it just depends on which items they want to have on the emergency backup system (so that when they lose power these items are powered up). What we typically do is come out for a visit at a customers location. During that visit we would go over the items that you’d want to back up during an outage. We would then calculate that load into the generator sizing. Part of the equation includes seeing if there are any elevators that would require motor starting, air conditioning sizing or lighting requirements. These are just examples of what we would look at that go into sizing of a generator.